Yup, its true! I am obsessed with Duck Dynasty! It makes me HAPPY, HAPPY, HAPPY! I like leftovers.... especially lasagna or baked ziti ! I LOVE laughter..........I love to hear laughter, I love to laugh, and I love to make other people laugh! I hate legumes...... I pretty much hate anything healthy... even the word legume is ugly! Go to my friend Farley's Oh Boy 4th Grade to join in on the fun!!!! TOP TEN GIRLFRIEND!!!! YAY... and legumes is hilarious... I need SPRING BREAK TOO... we need to meet and have a Margarita over the break!!! It's hard to motivate to start exercising...I have the same issue! I'd much rather be reading! There seems to be a spring break trend. =) Hang in there, friend! I see many others (including me!) are really neeeeding Spring Break! Hope this week passes quickly for you! I LOVE me some Duck Dynasty! Why?!?!? I am even getting The Mr to grow out his beard!! I LOVE Duck Dynasty as well! Family movie night tonight!! Think Happy Happy Happy until Spring Break comes! I'm cracking up that you hate legumes! It's such a funny word. I've never heard of Duck Dynasty - I'm off to Google it! Leftovers are the best!! I can eat cold leftover pizza or pasta anytime!! We can make it to Spring Break, it's almost here!! 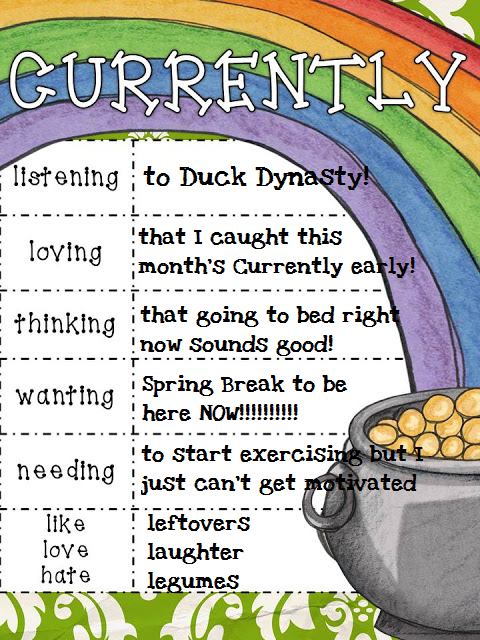 I also noticed the Duck Dynasty trend and several of us wishing for Spring Break. Hang in there. I am laughing so hard about the legumes. I am also wanting spring break! I just found your block through the currently! I am so interested in Duck Dynasty since everyone is talking about it! I hope it comes to Australia!!!!!! I am totally lacking the motivation to exercise also. Need to move it up on my priority list. Great choice with laughter. It is so important in life. I love it also. Spring Break SHOP TIL YOU DROP & WIN! This site is copyright protected. Nothing on this site can be reposted (excluding the button feature) without written permission from the author. This includes writing, photographs, images, and downloads.